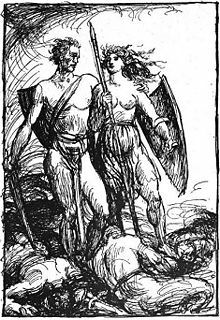 A depiction of Sigrún with Helgi Hundingsbane (1919) by Robert Engels. Sigrún (Old Norse "victory rune") is a valkyrie in Norse mythology. Her story is related in Helgakviða Hundingsbana I and Helgakviða Hundingsbana II, in the Poetic Edda. The original editor annotated that she was Sváfa reborn. "Helgi and Sigrun" (1901) by Johannes Gehrts. The two fall in love, and Sigrún tells Helgi that her father Högni has promised her to Höðbroddr, the son of king Granmarr. Helgi invades Granmar's kingdom and slays anyone opposing their relationship. Only Sigrún's brother Dagr is left alive on condition that he swears fealty to Helgi. Dagr is however obliged by honour to avenge his brothers and after having summoned Odin, the god gives him a spear. In a place called Fjoturlund, Dagr kills Helgi and goes back to his sister to tell her of his deed. Sigrún puts Dagr under a powerful curse after which he is obliged to live on carrion in the woods. Helgi is put in a barrow, but returns from Valhalla one last time so that the two can spend a night together. Sigrún died early from the sadness, but was reborn again as a Valkyrie. In the next life, she was Kára and Helgi was Helgi Haddingjaskati, whose story is related in Hrómundar saga Gripssonar. ^ Helgakviða Hundingsbana I at «Norrøne Tekster og Kvad», Norway. This page was last edited on 11 July 2018, at 00:14 (UTC).